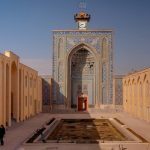 The Arg of Karim Khan or Karim Khan Citadel is a citadel located in the northeast of Shiraz. 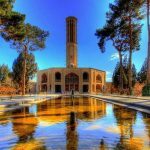 It was built as part of a complex during the Zand dynasty and is named after Karim Khan, and served as his living quarters. In shape it resembles a medieval fortress. At times, the citadel was used as a prison. Karim Khan Citadel or Arg of Karim Khan is located at city center of Shiraz. 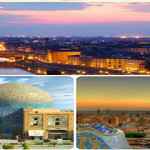 It has a land area of more than 4,000 square meters and is in the center of a 12,800 square meter compound. The citadel of Karim Khan consists of four high walls connected by four 14 meter round brick towers. 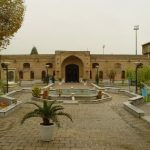 However, The design of Karim Khan Citadel combines military and residential architecture, for it was the home of Karim Khan and the military center of the dynasty in Shiraz. Arg of Karim Khan was built in 1766. 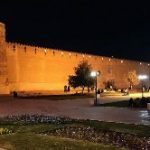 Karim Khan invited the best architects and artists of the time and bought the best materials from other cities and abroad for the construction of the Karim Khan Citadel, which was quickly constructed. During the Zand dynasty, however, it was used by the king as living quarters. During the Qajar period it was used as the governor’s seat. Tile works depicting legendary tales were added at the entrance gate of the citadel during the Qajar dynasty. Furthermore, after the fall of the Qajar Dynasty it was converted into a prison and the paintings were plastered over. The tall and unique surrounding walls provided security and at its top and at intervals are guard posts. In addition to a flat surface for guards to position themselves, they also include storage space for weapons. It may seem interesting: in the residential interior section, the north, south and west wings of the citadel each have a porch and six residential quarters. The eastern wing consists of a bath and other facilities. The main entrance is actually on this eastern side and above it is a drawing of a scene from the battle of Rostam and the White Demon. Once inside the main entrance one is welcomed by a long pool followed by an outdoor roofed porch supported by two poles. The courtyard is filled with citrus trees. 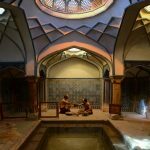 Arge Karim Khan has a tea room, itself housed within a bathhouse. Many of the rooms display photographs of Shiraz during the 19th and 20th centuries. Anyway, looking through the photos in chronological order one can see the very visible changed and civilian dress codes and the gradual advance of technology in Iran at the time. 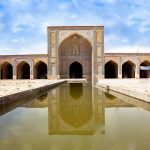 Let’s visit Karim Khan Citadel by Iran Destination! 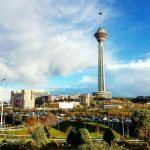 Iran Destination Travel Agency, as one of the best Iran Travel Operator offers the best tour packages in Iran. 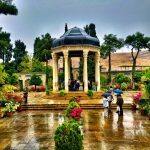 We can accompany you to visit Karim Khan Citadel in Shiraz.